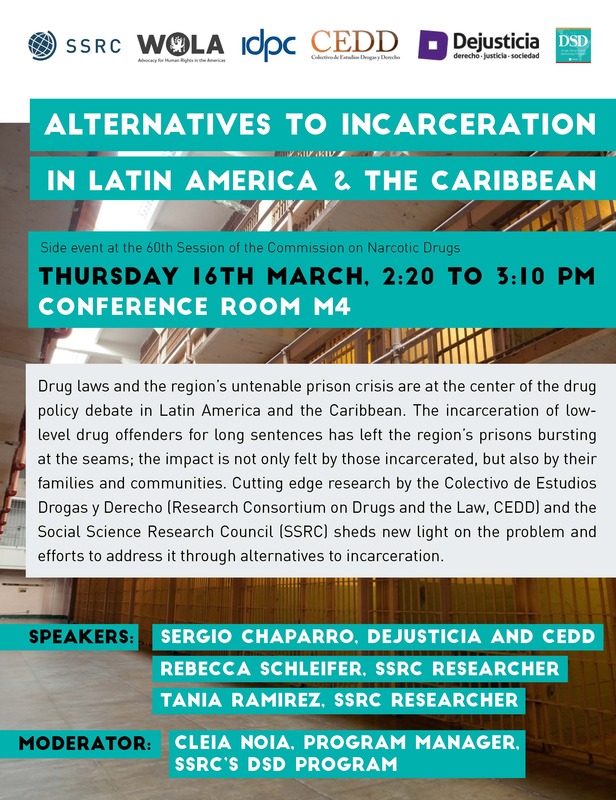 Drug laws and the region’s untenable prison crisis are at the center of the drug policy debate in Latin America and the Caribbean. The incarceration of low-level drug offenders for exceptionally long sentences has left the region’s prisons bursting at the seams; the impact is not only felt by those incarcerated, but also by their families and communities. Cutting edge research by the Colectivo de Estudios Drogas y Derecho (Research Consortium on Drugs and the Law, CEDD) and the Social Science Research Council (SSRC) sheds new light on the problem and efforts to address it through alternatives to incarceration. The latest investigation carried out by CEDD, which brings together researchers from 9 Latin American countries, shows that despite the lively debate taking place across the region, the number of people incarcerated for drug offenses continues to grow. The SSRC’s Drugs, Security and Democracy (DSD) Program is carrying out an investigation on drug courts in Latin America and the Caribbean. The research to date offers an analysis and critique of drug courts as a public policy option that is increasingly under consideration by Latin American and Caribbean countries, and the lessons to be learned from the U.S. experience. The session will conclude with a discussion of other alternatives to incarceration, including measures taken prior to the initiation of a criminal proceeding.